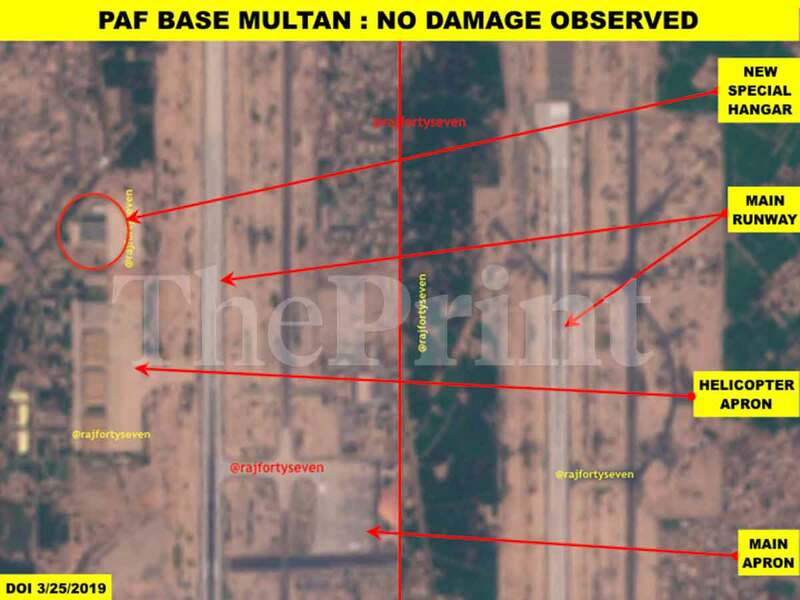 New Delhi: Almost exactly a month after India conducted air strikes on a terror camp in Balakot, Pakistan shut down the Multan International Airport at around 2:25 am Monday, 25 March. News agency ANI reported that roads leading to the airport were locked down and flights were suspended after reports of firing and explosions. Pakistan’s Dawn newspaper confirmed the shutdown, quoting the airport’s spokesperson as saying that the runway had to be closed due to “operational reasons”. Pakistani air space had not been reopened to routine commercial flights for a month since it was closed in the aftermath of the Balakot strikes on 26 February and Pakistan’s attempted retaliation in Jammu and Kashmir the next day. Notices to Airmen (NOTAMs) are being extended on a regular basis. Both the Indian and Pakistani air forces are running Combat Air Patrols intermittently to guard their skies from each other. But the incident in Multan has led to much speculation, especially on social media. Three main theories are being propounded, but ThePrint accessed satellite imagery to see how much truth there is to them. The first rumour being circulated is that five units of the LY-80 surface-to-air missile system that Pakistan is said to have deployed could not recognise the Pakistan Air Force’s own JF-17 aircraft due to an issue with the radar’s ‘identification, friend or foe’ (IFF) system. The speculation was that radar handlers and people manning firing systems took the JF-17 — which was on CAP duty — to be an Indian aircraft and shot it down. The possibility is remote for two reasons. 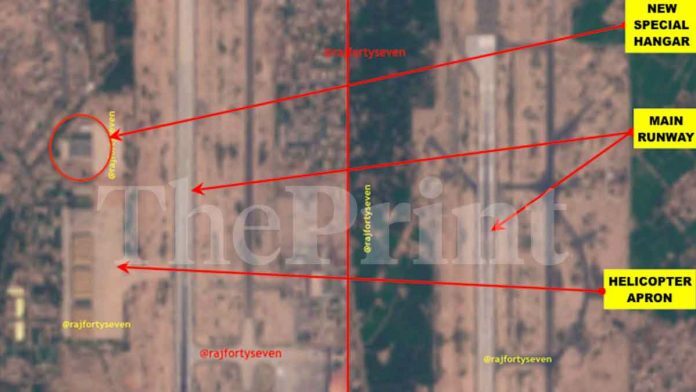 First, the JF-17 would have been observed by the LY-80 radar as being part of its own CAP and returning to base, unless an Indian aircraft was in a hot pursuit chase so deep inside Pakistani territory. 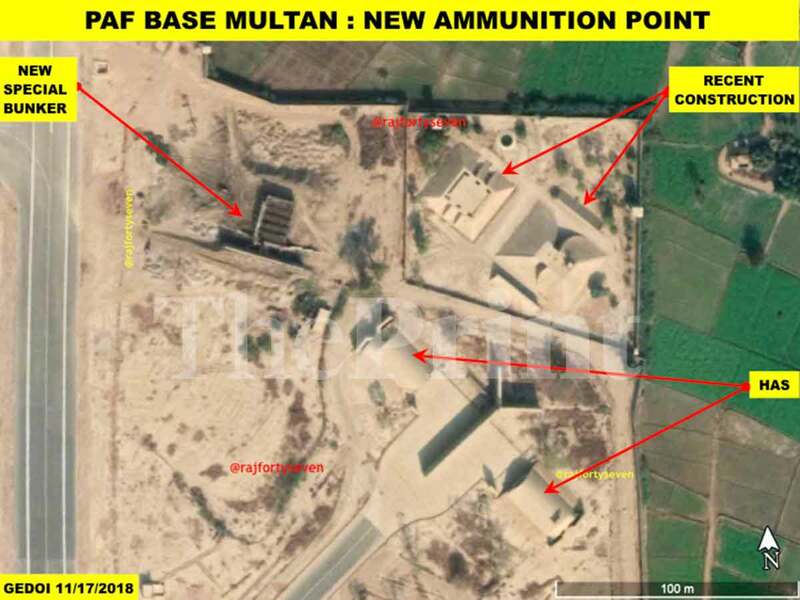 Second, Pakistan has received only one LY-80 so far, and its deployment anywhere around Multan has not been observed. WhatsApp rumours abounded that a huge explosion took place at around 2 am on 25 March, and the airport had to be closed due to the firing which followed the explosion. This indicated the possibility of a homegrown militant attack, the sort of which have occurred at air force bases like Karachi’s Faisal AFB and the Minhas AFB in Kamra. The reported sound of firing also was a big indication of such an attack. 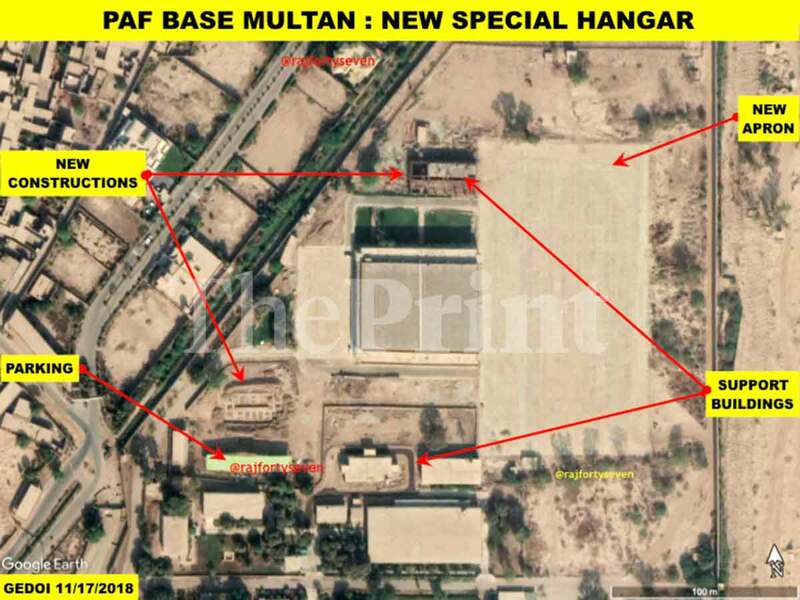 A special large hangar of 65m x 45m size, with two bays of more than 20m width, was recently constructed at the Multan airbase. The hangar also has special support buildings for manpower equipment and an ammunition bunker across the runway. The possibility of a fully-loaded aircraft in such a special hangar falling prey to militant activities is a very dangerous possibility. However, the latest low resolution satellite image from 25 March 2019 indicates that there has been no major damage to the structure. Some publications in India quoted the Pakistan Army spokesperson as saying that the runway was being repaired, and hence the airport was shut down. The spokesperson apparently claimed that one of the aircraft swerved away from the airstrip, creating the need for urgent repairs to the runway. This reasoning is again very suspicious because no airport would start sudden repairs to the runway at 2:25 am, especially when international flights are expected to land in a short while. No runway damage or repairs were observed on the satellite image taken the same afternoon. What Do Sources In Pakistan Say? Sources in Pakistan say there was an “accident” during refuelling at the airport, which resulted in two blasts. Some security personnel thought there had been an attack and opened fire in the air. The air space was closed for four hours, since no one was initially sure what kind of blast it was. The most likely possibility that emerges out of all this is that the Pakistan Air Force is now trying to justify the damage to its F-16 aircraft, which was lost in the dogfight over Bhimber on 27 February. It buttresses the Indian Air Force’s claim that Wing Commander Abhinandan Varthaman shot down an F-16 aircraft with his MiG-21 Bison, and indicates the possibility that the PAF is doing the groundwork to write off the aircraft.